Difference between revisions of "Dragon Eye Lake"
'''Dragon's Lake''' is a lake within the Unwavering Forest. An [[Igamon]] has recently moved to this location from [[Gear Savannah]] to escape from [[Patamon]]'s endless banter, and does not wish for its training to be disturbed here as well. However, [[Bakemon]] of [[Overdell Cemetery]] seems to have lost the key to [[Dark Lord Mansion]] on its recent trip to the lake, so one will have to interrupt Igamon from its training in order to search for the key, much to its dismay. Debut "The Blue Wolf! Garurumon"
Dragon Eye Lake (竜の目の湖 Ryuu no Me no Mizuumi, also Dragon's Lake) is a lake on the southwestern portion of File Island. Dragon Eye Lake is a lake in the Unwavering Forest of File Island. It is inhabited by a Seadramon. There is a small island off the shore that became disconnected when Seadramon pulled it away. Across from the island is rumored to be a land inhabited by insect Digimon, but the only way to get there is to ride across the lake. First appeared in "The Blue Wolf! 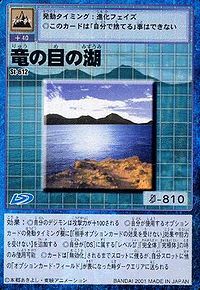 Garurumon", the Dragon Eye Lake makes an unnamed appearance as the lake where the Chosen Children spent their first night in the Digital World. When Agumon used his Baby Flame attack to start a fire the sparks from it burnt Seadramon's tail and he began to attack the children. Yamato jumped in the water to save his younger brother Takeru and he got captured by Seadramon in the process. At that moment his partner Digimon, Gabumon, evolved for the first time into Garurumon and he defeated Seadramon. Then the children found out that in order for their Digimon to evolve they need to eat and their human partner needs to be in danger. When the Chosen Children defeated Apocalymon they returned to this part of File Island in their moments in the Digital World to say goodbye to their Digimon. They took a trolley car on the center of the island back to the Real World and the first season ended. Dragon Eye Lake is a lake within the Unwavering Forest. At the northern beach connected to the Dragon Eye Lake is home to a variety of different fishes, and there is a vending machine selling DigiMushrooms and Meat as fishing bait. However, this vending machine is terribly overpriced... At a cape at the southern part of Dragon Eye Lake is said to be inhabited by a Seadramon. However, the only way anyone would get even a chance to see this Seadramon is by fishing it up with an Amazing Rod during Morning or Evening time. If one can fish up the Seadramon, it is said that it will give out a reward, including a ride on its back which takes a person to the distant land of Beetle Land across the lake. Dragon's Lake is a lake within the Unwavering Forest. An Igamon has recently moved to this location from Gear Savannah to escape from Patamon's endless banter, and does not wish for its training to be disturbed here as well. However, Bakemon of Overdell Cemetery seems to have lost the key to Dark Lord Mansion on its recent trip to the lake, so one will have to interrupt Igamon from its training in order to search for the key, much to its dismay. First appeared in the episode "The Blue Wolf! Garurumon" (蒼き狼！ガルルモン Aoki Ōkami! Garurumon), the Dragon Eye Lake is referred to simply as Lake (湖 Mizuumi), and is the location where the Chosen Children spend their first night after gathering food from the nearby forest. They are attacked by a Seadramon here.